This post is a tutorial on how to save data using JSON format. The method allows to compress multiple database records into a single one, thus, speeding up workflows that involve manipulating lists of records. Few weeks ago, while developing an app for a client, I hit a wall. The dynamic form I was trying to make required the database to copy/delete a list of 48 records. With a paid, professional plan, this process took 2-3 minutes! I still can’t conceive how a such small task can take that long. There are web apps today that deal with thousands of records in less time. After a few days of research I ended up with a workaround that solved the problem: shrinking the 48 records into a single one using JSON. Now my workflows are executing in less than a second. I got the advice to make use of API workflows; they run in the background so the UX doesn’t suffer from it. But what happens when the user fills out a form and after hitting “Save” they can’t see or retrieve the results before 2-3 minutes? This leads to confusion and frustration. Here’s a link to an app I made to show off a concrete example. I commented the elements and the workflows to explain what serves to what. Anyway the app is pretty simple. If it was for real, the app would be meant for automobile mechanics to use when they inspect cars. The app offers a list of components to evaluate and save as an “Inspection”. For every inspection, there are basic informations (Inspector’s name, car brand…) and there are 20 questions (or components) to evaluate. For each of them, the user can specify the level of degradation, the urgency to fix it and leave a comment. So what’s the best way to save an Inspection? Creating a “thing” in Bubble with a field for every piece of information? That would not be sustainable as there are 3 informations for every questions. So 3x20 means 60 fields. What if in the future we want to add 20 questions and add the possibility to specify a part number? This would mean 4x40 fields: 160. Bubble’s database is currently limited to 140 fields so we’d be doomed. The other way, the good one, would be to create a record for each question. This way we could add as many components as we’d like + a possibility of over 100 more fields for each of them. Unfortunately, this is where Bubble’s performances come short. To create 20 records at a time would take easily 1-2 minutes. The user experience is destroyed. The workaround (it really is just that) is to have our 20 questions saved in a JSON string that is saved in a single field of a single record. This is how this dummy app works. This includes planning what are the types of information I’ll want to save. Because the questions are dynamically generated in a repeating group, the JSON must be a list. 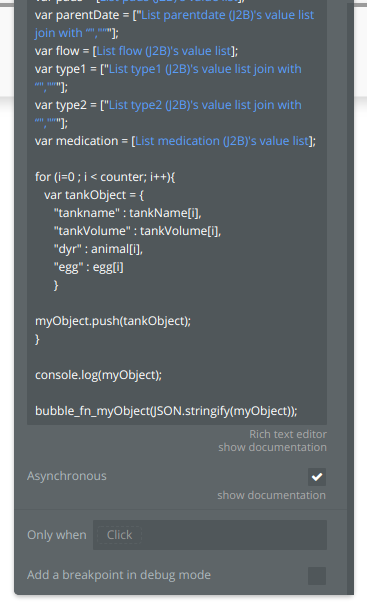 The JSON is saved in Bubble as the default value of the JSON custom state. 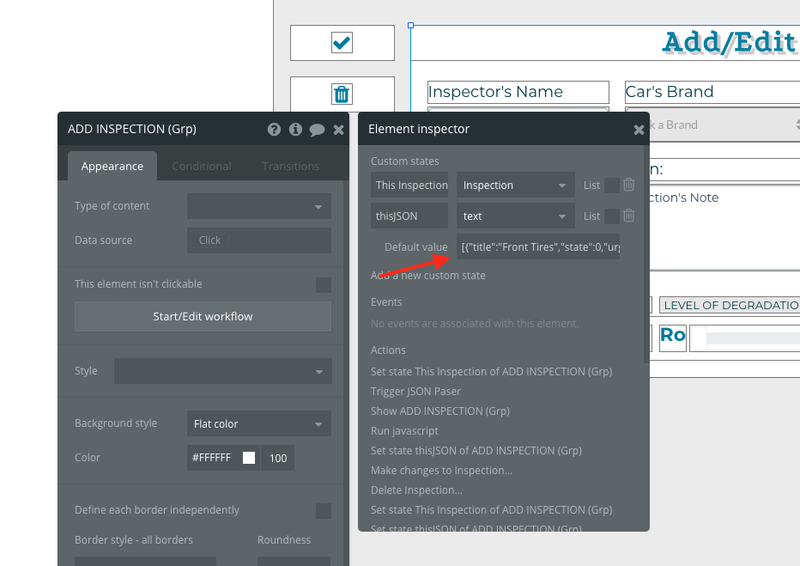 So whenever the user wants to fill a new inspection form, the template is taken as default. The only built-in way that I found to extract data from a repeating group without interacting with the database is with “An input’s value has changed” workflow trigger. So in the dummy app, there are 3 workflows: one for the slider (state value), 1 for the dropdown (urgency) and one for the text input (comment). The saving workflow is pretty straight forward as it takes the JSON from the custom state that originally held the template and puts it in the “JSON” field of the record that goes in the database. The process is exactly the same then creating a new one except for one thing. Instead of using the default value (template) of the JSON custom state, it takes the content of the JSON field of the record that needs to be edited and puts it in the custom state. Since the repeating group is populated from the parsing of the JSON, the inputs will reflect the values that were saved. Clear, concise and detailed! A couple of weeks ago we ran into a similar problem and had to pay quite a lot of money to use a non-bubble programmer to find a solution. If we can successfully implement this across our various other applications, you’ve saved us a ton money. Data Layer Plugin page on Bubble. Add Data Layer in one click to your app. Bubble lets you build web apps without any code. The editor I want to see is for your first link. Make it visible to all? There are various ways to implement this solution though, so you’ll might have to customize it to fit your app. Sorry I don’t understand what you mean. In the settings I’ve set the “Application Rights” to Anyone can view. @julienallard1 I´ve just been trying your way with json and it´s super fast. Excellent way to speed things up ! Any pointers to this setup ? On first run “registration” I am using the JSON stored in thisJSON custom-state. Everything displays fine on the page, but disappears when saving. 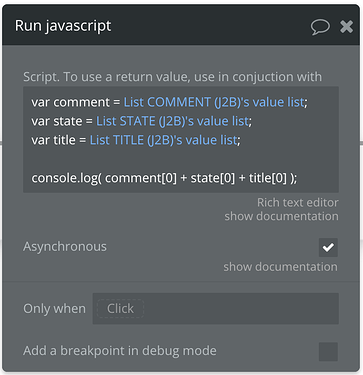 Values are changed before pushed to j2b elements and does not trigger the JSON updater. What’s the best way to approach this ? 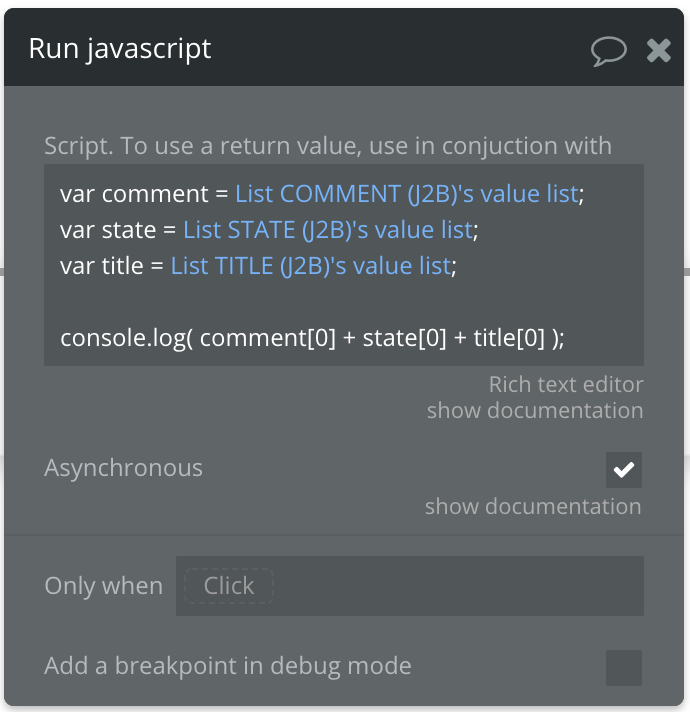 Take the demo app of this post: the code that updates “thisJSON” is called every time an input’s value has changed rather than when the users press “Save”. I tried to only update de JSON when saving but I ended up with an empty database field. Perhaps, just for the sake of proving your point, you could make a temporary button called “Update JSON” right beside your “Save” button. That you make two separate workflows. Beeing new to a lot of this, I am trying to find the best way to create a for loop to “reconstruct” the various lists into an object i can stringify Any good links to other examples ? Should I just create a for loop where I push the values to a saveJSON object ? Hey @julienallard1, thanks for an amazing tutorial. I can’t wait to try it out! I’m curious to know if you tried to solve your user interface problem by making the input values within the repeating group be saved by auto binding? Hi @antony, yeah I did try auto-binding. It helped for the saving process but I still had to create the entries in the database first so I could have a source for the repeating group. The auto binding function is also a bit slow; if the user changes values to quickly, the process can get “lost” with too many input change and skip them. I don’t have other exemples. I came up with the solution myself. What I really need to do is to take all the J2B list I have populated from parsing and “link” them all back to an array of JSON Object that I can then stringify and save. Hi @julienallard1, thanks for letting me know your experience of the autobinding. I used it extensively a year ago and found exactly the same problems. It seems like a utopia, but isn’t in practice when it gets “lost”, as you very accurately describe it. I’ll have a play with your method and see how I get on! You’re right, in the screenshot I posted, I forgot to put the dynamic content between quotes.